In the west pier of the arch leading from the Baptistry into the south aisle (the pillar on your right as you turn into the Baptistry from the aisle) are the doorway and stairs which used to lead to the Chapel of the Fraternitie of St. Katherine. The piscina, which was used by the priest before the Reformation for washing out the vessels used in the Mass, from that chapel can still be seen high up on the south wall. During cleaning of the stonework, traces of Latin inscriptions were found on the walls but, as they were under plaster, it has not yet been possible to uncover them completely. The lower east window in the Baptistry contains stained glass by Burlisson and Crylls. The window was uncovered during the major rebuilding of the church in 1875-78 and the glass was inserted in 1907 when this area became the Baptistry. The figures in the glass combine the present and original uses of this area of the church. On the left is St. Katherine of Alexandria, the patron saint of weavers and spinners, together with the symbol of the wheel on which she was tortured and which we now know as a “Catherine Wheel”. 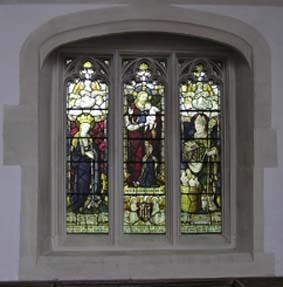 In the centre of the window is a portrayal of Christ and “Suffer little children to come unto me”. On the right is St. Nicholas, the patron saint of children. The three children in the tub illustrate the mediaeval legend about St. Nicholas, then Bishop of Myra, restoring to life children who had been killed and were being salted down for meat in a time of great famine in the fourth century. The striking stained glass window in the south wall of the Baptistry is the work of Christopher Whall and commemorates three brothers killed in the First World War. These three young officers were the sons of Dr. Mervyn Seppings Wilson of 19 St. Mary Street behind the church. The principal figures in this window are the four archangels who minister to the sorrowful, and below them are impressions of war scenes.